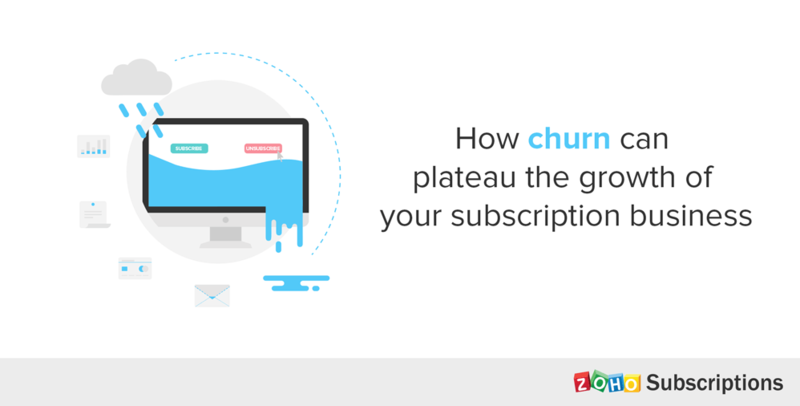 Churn: The big hairy beast that every subscription/SaaS business has to face. Turning a profit on subscription businesses is a long-term game. Consider this scenario: you spend $300 to acquire one customer for your business, and you charge him $50 per month. In order for you to break even, it’s critical that your customer stays with you for at least six months. If you want to turn a significant profit, it’s critical that your customer stays with you even longer. However, if most of your customers are churning on the third month, you’re losing money. Many subscription businesses and early-stage startups burn a lot of money on customer acquisition, only to discover that most of them are churning. Such high levels of churn indicate deeper problems in both the product and/or service and your after-sales experience. These problems cannot be solved by simply spending more money on customer acquisition. It’s unlikely that your problem is this extreme. Chances are that only five percent of your customers are churning per month. Although this may not seem so bad at first, it’s actually much worse than you think. Because each additional customer you acquire is equally likely to churn, your churn rate remains the same. However, you cannot acquire customers fast enough to compensate for the larger number of customers that will churn every month. 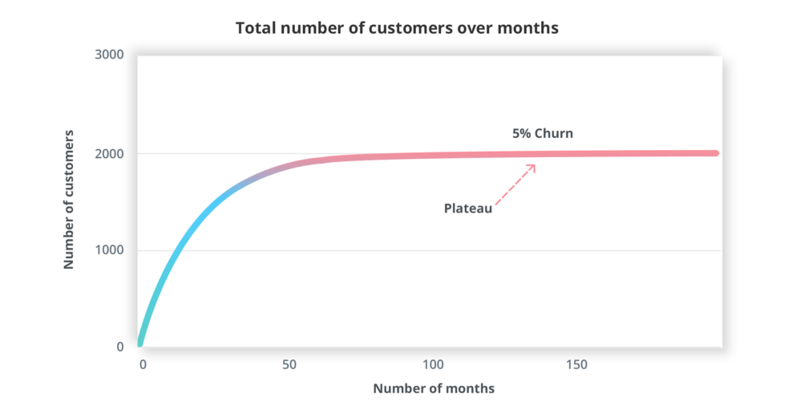 Although customer acquisition works in absolutes, churn rate works in percentages. So your churn compounds with your increasing customer base. Let’s consider three different situations, represented by each row on the following table, for a hypothetical subscription business to illustrate this point. As you can see, by the time this business reaches 2,000 customers, its monthly churn rate of five percent has completely halted its growth. Here is the same data represented in a graph. Bonus! Here’s a handy revenue forecaster tool that charts a graph just like this one! The only difference is that the tool works with monthly recurring revenue instead of customer count. Enter your metrics and the graph will auto-generate, giving you a forecast of your business growth and at what point it will plateau. You can also enter different churn rates to compare how your business will grow at these different rates. This graph shows how the same business performs with a churn rate of 2.5 percent and 1 percent. As you can see, a 2.5 percent churn rate shows double the growth of a 5 percent churn rate, while a one percent churn rate shows more than four times the growth. 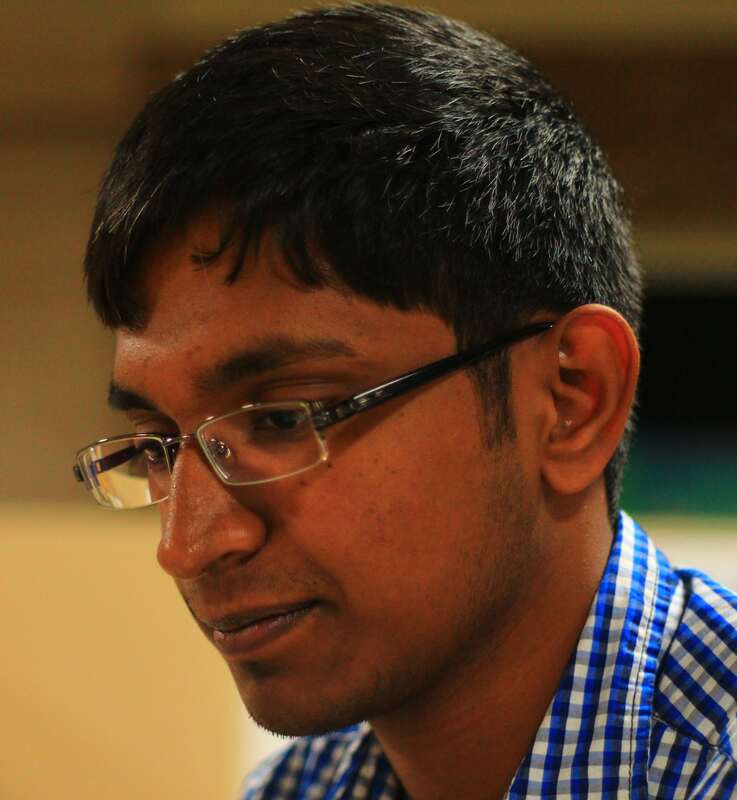 You may think, “I can’t keep acquiring only 100 customers every month. Surely, those numbers should increase?” Well, unless you find new channels for customer acquisition, your numbers won’t increase enough to make a significant difference. Your existing acquisition channels have a limit as to how many customers you can obtain from them. For example, if your business depends entirely on AdWords, every additional dollar that you spend on AdWords will have a lower ROI than the previous dollar has. Eventually you’ll reach a point where the amount of money required to acquire one more customer in a particular time period is a 100 times more than the money required to acquire your first customer for that time period. There’s a limit as to how much you can milk your existing customer channels. Because it’s not easy finding new channels, reducing your churn and retaining your existing customers are critical to your business growth. Is your product/service really satisfying your customers’ needs? Is it targeting and bringing in the right kind of people? Do customers outgrow your product, or is your product/service no longer useful after a period of time? Are there any features missing? Are there too many features? In the SaaS world, getting the right answers to the above questions means you’ve attained product-market fit (PMF), without which your business has little chance of surviving. 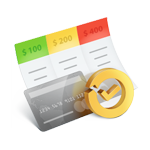 Unexpected credit card failures can cause a customer to churn involuntarily. Spreedly’s Gateway Index estimates that the average credit card transaction fails 17 percent of the time. Not only does this mean that you potentially lose a customer, but it also means that your customer has to deal with the inconvenience of a temporary service cancellation. Because of a credit-card failure, your customer could cancel his or her subscription altogether. Dunning (or delinquent user notification) management solves such problems by automatically notifying the customer of the failed payment, while also attempting two to three retries to charge the card. This is easy to implement with any recurring billing software, such as Zoho Subscriptions. Compared to every other method of reducing churn, dunning management is not only the easiest to implement, but is also really effective; there’s no reason not to get it done right away. Customers love engaging with a subscription business that has a super helpful and friendly support team. As long as you’re not being obtrusive, most customers are happy to receive calls and talk about your product/service. Customers feel special when you offer to help them out. They will remember how your business and/or brand made them feel. Some customers discover that your product is simply not a good fit for them, and they will cancel without reaching out to you. Avoid such silent cancellations by reaching out to them first. Up-selling higher plans, upgrades, and add-ons to your existing customers is a great way to fight the compounding effect of churn: Users are more inclined to purchase better stuff from you as their needs increase. For example, users of a cloud storage service will purchase more storage space because they have more files they need to store. Similarly, businesses who use payroll software will pay more and more money per month as their employees grow in number. The model that we used to chart the above graphs is somewhat artificial because it assumed that the business would keep acquiring the same number of customers every month. We also talked about how you shouldn’t bank too much on spending more money to acquire more customers because your customer acquisition cost (CAC) increases with every additional customer acquired. You can’t let your CAC exceed your customer lifetime value as this will run your business into a loss. In reality, however, you don’t always need to spend more money to get more customers. There are many ways to get new customers for free. For example, like Dropbox, you can use a referral program to leverage word-of-mouth marketing. You can leverage free platforms like Reddit. You can go heavy on blogging and inbound marketing and attract lots of free traffic via Google. You can growth hack your way to success. Now, growth hacking is a separate topic altogether, but the takeaway from this point is that by getting creative, you can acquire more customers with minimal spending. I encourage you to go ahead, get your numbers, and put them into the forecaster I linked to before. With your current numbers, find out where your business is going to plateau; start taking action to avoid that, and accelerate the growth of your business. If you have any questions, don’t hesitate to comment below! 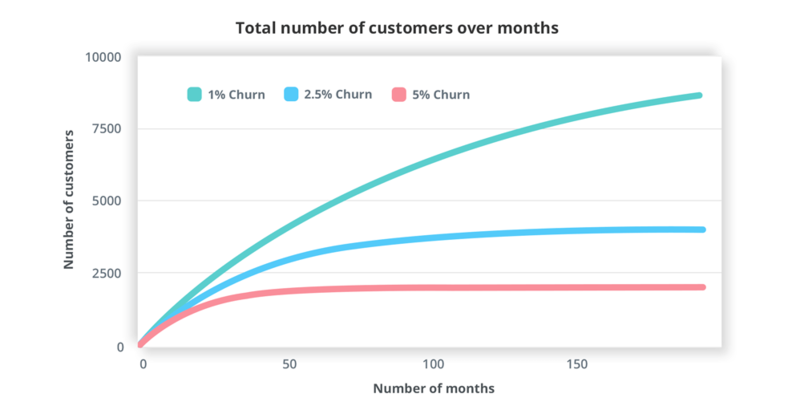 Greetings – Your CMRR model and how it shows the impact of churn on monthly recurring revenue has really helped our business to get a better understanding of the concept. Many thanks for providing this. we are also a SaaS based CRM provider focusing only on Iran’s market.